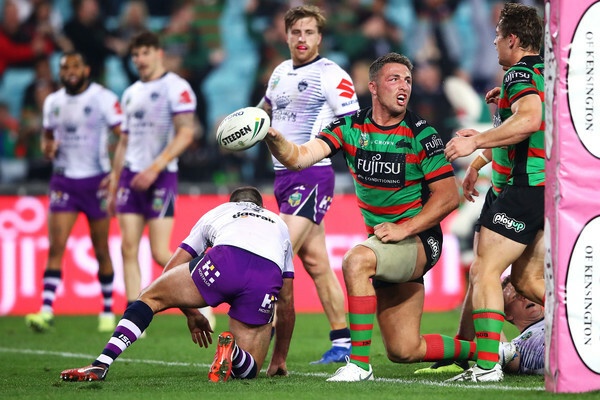 Friday night’s match between the Bunnies and the Storm was as high octane as you’d expect from the top two teams with four weeks to go until finals footy. The Rabbitohs were the first to put down points, thanks to a penalty goal for Adam Reynolds four minutes in, but the Storm were the first to get a try, thanks to a superb line bust from Felise Kaufusi, followed by a catch-and-pass from Billy Slater to get the purple army down to the right corner, where Will Chambers was in prime position to get the Steeden across to Cheyse Blair. Some good clutch defense from the Rabbitohs might have prevented Blar scoring points then and there, but Melbourne didn’t waste any time moving the ball back to the left, where they got a penalty and a fresh chance at the line. All it took was a short ball from Cameron Smith to send Dale Finucane into a twist and spin that saw him tumble onto the chalk and reach back to ground the footy behind his head, while Alex Johnston struggled to get out from beneath him. It was a momentum-building play, and yet the Storm lost that momentum on the restart, where Munster let Ryan Hoffman clean up a difficult kick from Reynolds only for the ex-Warrior to knock it on. The Rabbitohs made the most of the turnover, with some big efforts on the left edge from Dane Gagai, who got a penalty from Slater, and then Hymel Hunt, who stormed over the defence before almost making it to the line. At the other side of the field, a harbor bridge pass from Reynolds looked to set up Campbell Graham to put down points, only for some good defence from the visitors to shut down the play. Still, an early tackle from Curtis Scott gave the Bunnies a second chance a couple of sets later, and they made the most of it, with Damien Cook sending a good ball across to Cody Walker, who responded to Slater’s catch-and-pass with a brilliant effort of his own to put Hunt across in the corner. With Reynolds failing to add the extras, Souths were now neck and neck with the Storm, but they’d had to work for it – a fact made even clearer by the effortlessness with which Melbourne put down their next four points. It was a classic Storm set play, as the Steeden moved through Smith, Munster and Slater, before Josh Ado-Carr put down a trademark try in the corner. The Bunnies’ frustration was enhanced by a perceived obstruction from Hoffman on Reynolds, and they vented in good fashion by taking Tim Glasby over the sideline a couple of minutes later. Still, the Storm proceeded to dishevel the Rabbitohs as the clock wound down to half time, with Cook losing the ball on one set and then Sam Burgess passing it to nobody on the next. No surprise, then, that Melbourne were the next to score, thanks to an inspired linebreak from Ado-Carr, who put in an enormous fend on George Burgess before dodging past Reynolds and Murray to get the ball across to Scott, who scored right beneath the posts. The Storm had now gone from a four point lead to a ten point lead – a pretty worrying statistic for the home team as the half time siren loomed. The Bunnies got their chance, though, when Will Chambers failed to clean up a last-tackle kick, gifting the home team a goal line dropout, which resulted in their second try of the night. Appropriately, it was bookended by the Burgess brothers, who had been outstanding up through the middle, with George starting things off with an enormous run to make some quick metres. From there, a quick play-the-ball from Murray caught Glasby by surprise, setting the platform for Cook to send the Steeden over to Sam Burgess, who beat both Smith and Hoffman to burrow his head down and get the ball to ground. It was Slammin’ Sam’s first four points since Round 17 last year, and a cathartic sight to see him reach out his hand and score after so many efforts from the cardinal and myrtle. The Bunnies made the most of their runner’s high, amping up their field position and defence after the break. It was now the Storm’s turn to be disheveled, with Nelson Asofa-Solomona botching the play-the-ball at a critical juncture, and the purple army prevented from getting to the last tackle of two successive sets. No doubt, South Sydney had their own share of frustrations, including a knock-on from Jason Clark right beneath the posts, but they regathered each time, finally consolidating enough for Adam Doueihi to score off a brilliant string of passes from Reynolds, Walker and Johnston. As the adrenaline peaked, the second half of this game of football started to take on a bit of a grand final quality, delivering one memorable sequence after another. In one especially exciting passage of play, the Storm renewed their focus with a series of offloads that got them right up to the line, only for Campbell Graham to come up with the take of the night under the high ball, holding his hands up over his head to gather the footy and then make his way up the field. Dane Gagai followed up with an equally impressive run, while a deft gruber at the other end of the field saw Chambers trapped just within the in goal area, paving the way for a Rabbitohs dropout. The momentum now shifted in the Storm’s favour, however, with Slater showing some quick thinking to gather up a hard kick from Doueihi after it struck him in the chest to commence yet another period of Melbourne attack. A pair of injuries now boded badly for the Rabbitohs, as Doueihi was taken off with a hip issue in a sorry sequel to his stunning try, while Cook was momentarily downed with an ankle complaint. That was a sobering sight indeed for the South Sydney faithful, although it only made Cook’s recovery and subsequent try all the more spectacular and motivating. This was easily the best try of the night, and one of the individual tries of the 2018 season, outshining even Ado-Carr’s mammoth efforts, partly because the Fox was one of its main casualties. Poking his nose through the line, Cook broke away from Asofa-Solomona, skipped out of a low tackle from Slater, and then sliced his way past Ado-Carr, for a try that looked better and better with each replay. If the Fox’s earlier linebreak had been a statement of purpose, then Cook responded in kind. The fact that Cook had been threatening the line with his speed all night made this doubly cathartic, propelling the Bunnies to their next try, which occurred seven minutes out from the final siren. Once again, it was built on a defensive platform, with a shutdown of Ado-Carr setting the scene for Johnston to plunge through the line a couple of tackles later, thanks to yet another catch-and-pass from Walker, and a poor defensive read from Blair on Sutton that opened up the space. A minute later, Smith was led off the field hobbling on one foot – a spectacle that summarized the utter dominance of the Bunnies in these final minutes of the game. They hadn’t beaten the Storm since the 2013 finals, and their victory felt every bit as momentous as that statistic would suggest, even despite a late consolation try from Ado-Carr. With Greg Inglis back on the field this week, they’re going to be raring for another display like this when they take on the Roosters at the same time next Friday night, for what should be one of the most galvanizing matches of Round 22.